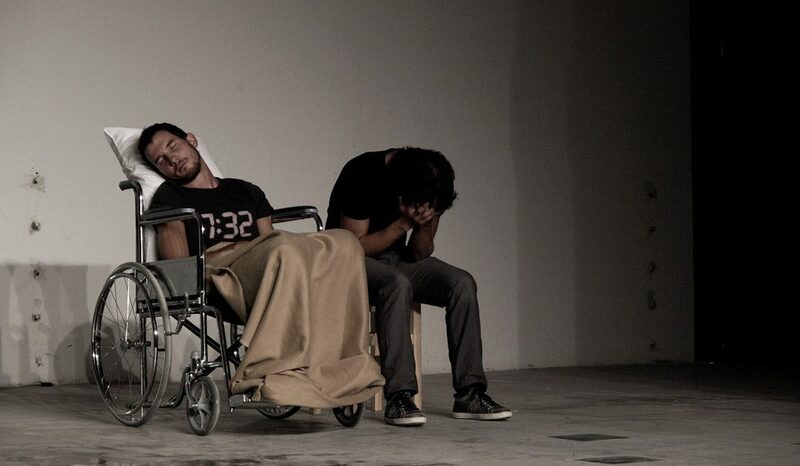 Homo Ridens is a performance conceived as an experiment on a sample, as a test the audience is put through. 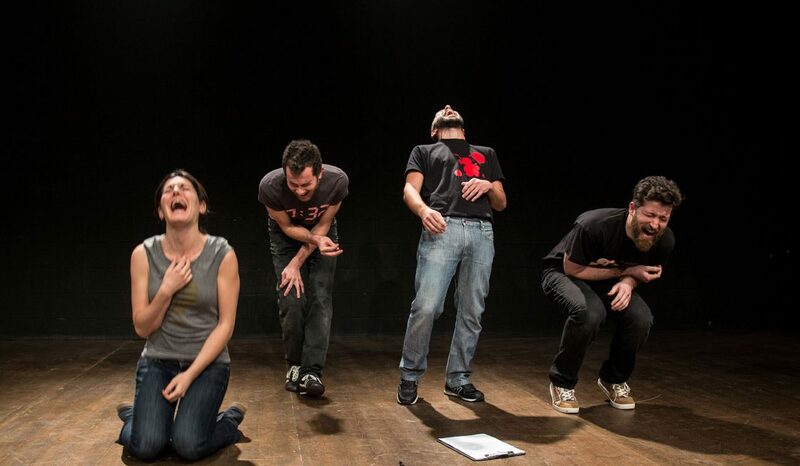 The ‘guinea pig’ audience is asked to react to a given stimulus regarding laughter and its driving mechanisms. During each performance, the research is monitored and updated with results for each town, hence why the town’s name is added to the title. The main purpose is to analyse human’s approach to laughter, measuring its limits and complexity. When we laugh, we give up the vital function of breathing; when we laugh we grind our teeth in a facial expression similar to animal aggressiveness. Laughter manifests itself as pure entertainment as well as a powerful rebellious tool. Laughter makes men self-conscious and we know that selfconsciousness makes men aware of death. So then… why are we laughing? «The group from Tuscany proves they are experiencing a creatively special moment thanks to Homo Ridens, which carries on the surgical study on everyday decay, this time by analysing laughter and its patterns». «It’s a smart but surgical neo-dramaturgy, which strongly criticises the laughter abuses carried out by the powerful ones, and the tragic consequences of our addiction to everyday tragedies. The fake pseudo-scientific tests become a disturbing introspective research: they force us to look inside ourselves for what we are, to investigate some of our internal contradictions». «It is a sort of game or experiment involving the audience in a test on the process of laughter, carried out through a scientific approach they subtly scoff at. They use the devices they have always been using, […] quick dialogues and actions, scarce but suggestive dramaturgy. A simple recipe that is never condescending. The outcome is always a bit upsetting». «Sotterraneo strengthen their cleverness, their ability to provoke embarrassment, by deconstructing with smiling ferocity, apparently on the edge of joke, our society based on representation. […] It looks like the apocalypse with a final laughter». 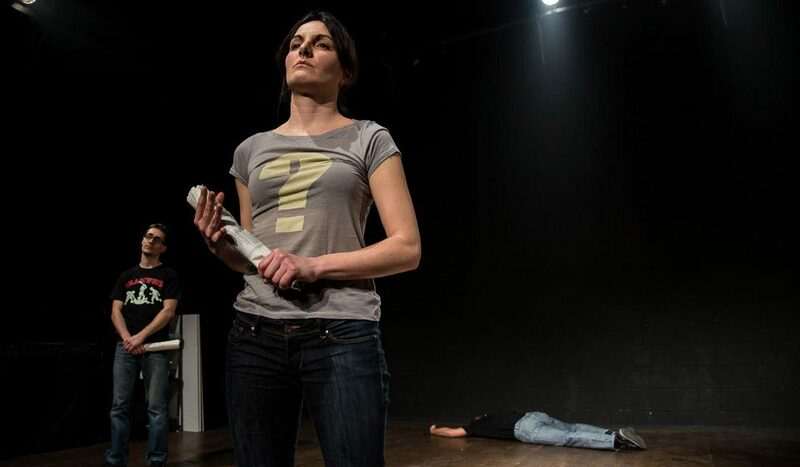 «In our opinion, the experiment carried out on the audience regarding the different forms of laughter, is one of the smartest examples of “civil” theatre we have seen in the last few years. […] While laughing. But there are many different types of laughter. As there are many ways to develop and foster a “civil” thinking».